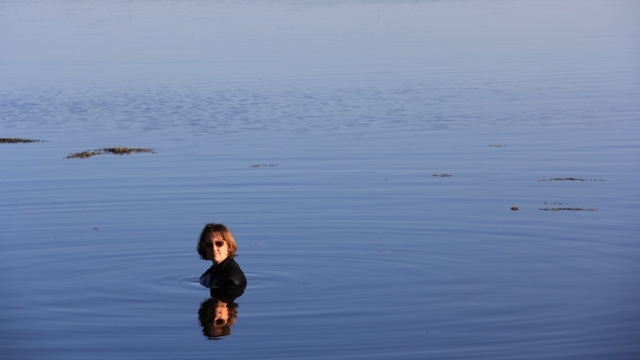 On August 15th, performance artist Sarah Cameron Sunde will stand in the San Francisco Bay for a tidal cycle of over thirteen hours. At high tide, she'll be covered up to her neck. 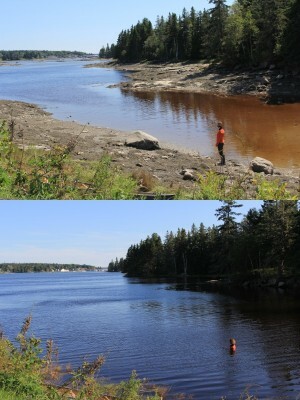 This is the third iteration of her 36.5 water project, which dramatizes the challenge of rising seas. Climate change is driving up sea levels around the globe at an accelerating rate. Tidal gauges show that San Francisco Bay has already risen by 8 inches since 1900. Scientists estimate a further 16-inch rise by 2050, and 55 inches by 2100. The Bay Conservation and Development Commission has used these numbers to project land loss of 281 and 333 square miles, respectively, including residential developments, schools and health care centers, roads and airports. 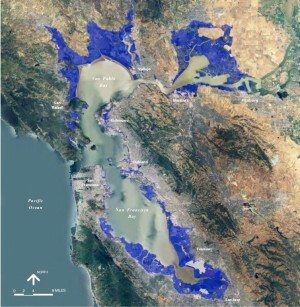 Potential inundation caused by 55-inch sea level rise by 2100. San Francisco Bay Conservation and Development Commission. Sea level rise data provided by USGS. Knowles, N. 2008. Siegel, S.W. and P. A. M. Bachand, 2002. What Is Your Relationship With the Water? After standing through an enormous ten and a half foot tidal fluctuation in Maine, Sunde's second performance could seem anticlimactic. 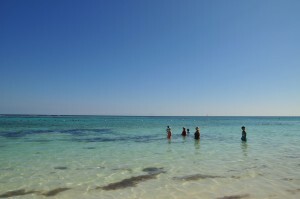 In Akumal, Mexico, for another residency, she stood patiently for twelve hours through a tidal shift of just one foot. Akumal is on the Yucatán in the Caribbean, a region highly dependent on coastal tourism and therefore highly vulnerable to sea level rise. According to the Union of Concerned Scientists, “Relative to the size of the economy, the Caribbean is the world's most tourism-dependent region. If climate change makes this region less appealing to tourists because hotels have diminishing beaches, or because resorts experience flooding, the region could suffer serious economic losses and growing poverty.” Forty inches of sea level rise, for example, would flood hundreds of miles of roads and a third of all Caribbean airports. The Mexican government has attempted to rebuild beaches that are already eroding, but such projects are hugely expensive and only postpone the inevitable. After San Francisco, Sunde will move her project around the world. The next stop will be Europe, where she plans to stand through a tidal cycle in one of the cities most intimately aware of rising seas: Amsterdam. The Netherlands was fighting to stay dry centuries before the Industrial Revolution heralded anthropogenic climate change. The country is at once uniquely vulnerable, and uniquely prepared to cope. The Dutch have been keeping the sea at bay with an ever-increasingly sophisticated system of dikes, floodgates, and sea walls. But now they’ve begun to work with the water rather than against it, lowering certain dikes to allow flooding and reduce the pressure in other parts of the system. They’re even experimenting with floating housing developments. Sunde's husband grew up in the Netherlands, making this a very personal destination for the artist. In fact, she is choosing all of her sites based on intimate connections with her own life. This is art in extremely mixed media: a single human, the world ocean. If you show up at Aquatic Park on August 15th between 9:26am and 10:31pm, you’ll see Sunde and her video crew. You can sit and watch from a variety of vantage points, and you can wade out and join her for a time. At 4:09 pm, high tide, the water will be at her neck. Another eight-inch rise in sea level would cover her head.